The workshop is based on two of Jo Strømgren Kompanis performances: A Dance Tribute To The Art Of Footable delves into the physical routine of football and elevates the aesthetic aspects of its insanity. It was made in 1997 as the first of its kind, has been performed in over 30 countries, and received several awards. 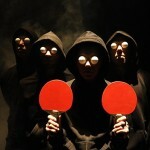 In 2011, JSK made the follow-up, exploring another of the great sports －A Dance Tribute To Ping Pong, where four youngsters are taught Eastern philosophy in record time and take ping pong to a transcendental level. The workshop offers a unique introduction to the work and artistic world of Jo Strømgren Kompani and is held by two experienced members of the company; Mikkel Are Plsenlund and Jan Nicolai Wesnes. Participants will be given various dancing tasks as well as rehearse selected scenes from the above mentioned performance. Join the workshop and experience a new logic!